Un dégraissage chez un spécialiste est nécessaire. TRÈS TÂCHÉ recto et verso. Echarpe en laine, Benetton, couleur vert pale/vert d'eau. Écharpe United Colors of Benetton. Coton blanc, fabriquée en Italie. Couleurs Unies de l’écharpe en laine Benetton Teal. Material Wool. Largeur - 11.5 ". Color Blue. United Colors of Benetton Écharpe en tricot, violet moucheté. Service de Concierge. 100 % Original. Écharpe laine Benetton. étiquette composition manquante. Vends écharpe fillette Benetton. Couleur mauve. Occasion bon état, achetée en boutique. 32% LAINE, 32% POLYAMIDE, 30% VISCOSE, 3% CACHEMIRE, 3% AUTRE FIBRE. TAILLE : 10 À 12 ANS. ENVOI EN LETTRE SUIVIE GRATUIT. ASPECT ET TOUCHER TRÈS DOUX. United Colors of Benetton great, versatile scarf The size of this scarf and the lightweight cotton fabric makes this scarf very versatile. Wear it as scarf in many ways, a stole or even a beach wrap/sarong! The size of this scarf and the lightweight cotton fabric makes this scarf very versatile. Wear it as scarf in many ways, a stole or even a beach wrap/sarong! 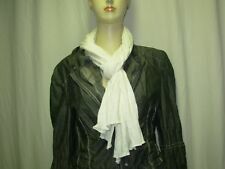 Great, versatile scarf style : lightweight scarf with tied tassle design at each end. Benetton Teal Blue Scarf Brand New £30. Condition is New with tags. Dispatched with Royal Mail. BENETTON - MADE IN ITALY. PRETTY GARDEN BOTTLE GREEN BORDER NECK HEAD SQUARE SCARF. 51cm square scarf,weighs only 19g. GORGEOUS BUTTER CREAM PLAIN SIMPLY STYLED SHAWL SCARF. MADE IN ITALY. Very very good condition - a feint dust mark, barely visible. Not sure of texture - woven, maybe wool, i'm really not sure. United colours of Benetton multi coloured scarf. Great, versatile lightweight scarf Fabulous to pair with all shades of denim. colour : shades of navy blue and lighter blue. style : striped on one side and checked on the other side, see photos for design. Fabulous to pair with all shades of denim. Great, versatile lightweight scarf colour : shades of blue and white. style : striped on one side and checked on the other side, see photos for design. I have a fantastic Benetton patterned scarf. Style : naturally crinkled with ruffle design, see photos. Great, versatile lightweight scarf Fabulous to pair with all shades of denim. colour : navy blue. size : 220 x 75 cm. Great, versatile lightweight scarf material : 90%viscose & 10% silk. colour : shaded blue & green stripes - see our photos for the design. Gorgeous United Colours Of Benetton Square Scarf with colours Brown Peach Red and Mustard. Condition is used but no rips or damage. Perfect for spring as a head scarf or a lightweight neck scarf. Approx measurements: 34inches square. Please look at my other items as I have various fashion items on sale currently or coming up soon. Please pay via PayPal within 48 hours of auction end. I aim to ship within 3 working days of payment clearing. P&P (Postage & Packaging) costs include what the term suggests, thank you for understanding it may be slightly more than just the cost of the postage alone to allow the safe transit of the item with secure packaging. UNITED COLORS OF BENETTON écharpe principalement Laine Neuf Dans Paquet RRP £ 29.90. STYLISH UNITED COLORS OF BENETTON SCARF. UNISEX ONE SIZE. Echarpe beige Benetton. Portefeuille toile beige.